What did you do to your Mirage today? Thread: What did you do to your Mirage today? Car Nut: good thread idea. Think I'll put it in "general" and sticky it! Dude.. You just killed mother earth.........ROFLMAO! Got my first oil change today. 2235 miles. Car has been averaging 43 mpg since I've had it. So 52 gallons used so far. I just got the power washer and foam cannon so I'm still learning how to use it properly. Once adjusted properly it did a great job and made quick work of everything. My car was a roving filthball due to the road salt and dirt in Western Pennsylvania winter time, now it's clean and shiny. This was just a quick wash to get it cleaned off and to practice using the power washer and foam cannon. Next month or so I will be clay barring and waxing it. I pulled the carpet remnants out and removed the driver side factory floor mat to clean some salt from it. 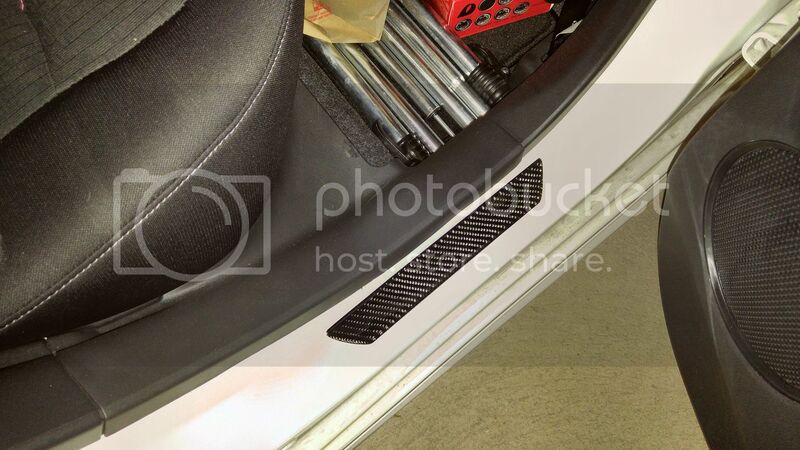 I vacuumed the "Fake" carpet (best way to describe this stuff they call carpet) and wiped down the door sill plates and door panels from scuffs. Waiting for spring! The Mirage is a pretty quick and easy oil change, you should do it yourself and save the $$$ plus you can use better stuff. I personally use Mobil 1 oil and filters but to each their own. I just got the power washer and foam cannon so I'm still learning how to use it properly. What did you get? Pics & links please! I've been thinking about getting one to help keep the salt corrosion at bay. FTWIW I only used 2 layers of Plasti-Dip. I heated the can up a little because it was cold for better "atomization" (a fine mist/spray vs a blotchy spray) and I waited 30-45 mins before applying the second coat. Then I waited 1 hour and started removing the tape. I used an exacto blade and very lightly cut down the lines I made with the green tape (hopefully didn't go through and into bumper!) to help with tape removal to keep crisp lines! If you wait too long this will make it harder to do a clean tape removal. Going to be putting in rear lowering springs next. But I want to do the vinyl tubing over the springs to reduce wear on them before I put them in. Might also pick up a bike rack for the roof racks. Tonight I ordered red vinyl to throw some color onto the Mitsubishi logo on front, rear, and on steering wheel. I will be de-badging the "Mitsubishi" and "Mirage" lettering from the rear of the lid as well in the future! Heat gun and fishing line Worked awesome before on my old Yaris. Then just Goo-Gone the remains. Oh and also ordered a Mini-VCI J2534 cable and luckily found my dads old laptop with a 32 Bit Windows XP. Phew! $15 dollar cable vs a $40-50 64 Bit one... Will be hopefully enabling these fog lights soon! And future cruise control..
Last edited by 23027; 02-22-2017 at 06:06 AM. 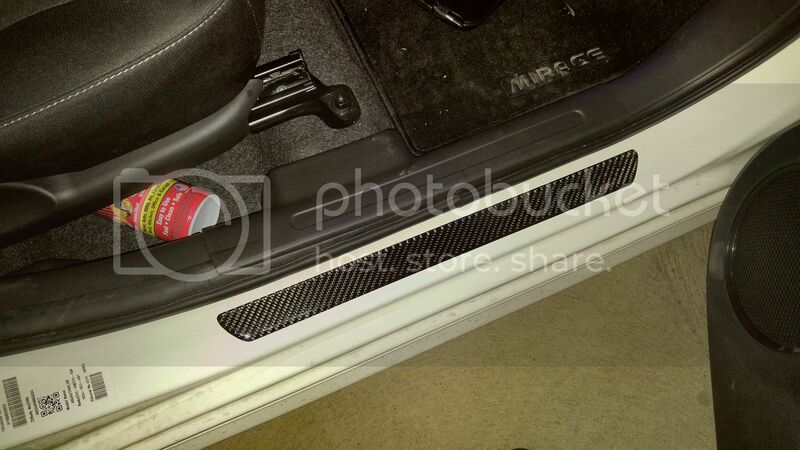 I installed some Carbon Fiber door sill guards. They're more show than function, but they look real nice IMO.